An archaeological dig on a Scottish island has unearthed the remains of what is thought to be a monastery founded by one of the country’s first Christian saints. St Donnan brought Christianity to many places in the West Highlands in the seventh century before settling on Eigg. According to local folklore, he became a martyr after he was killed by Norsemen, along with 50 monks, while giving Mass on Easter Sunday in the year 617. 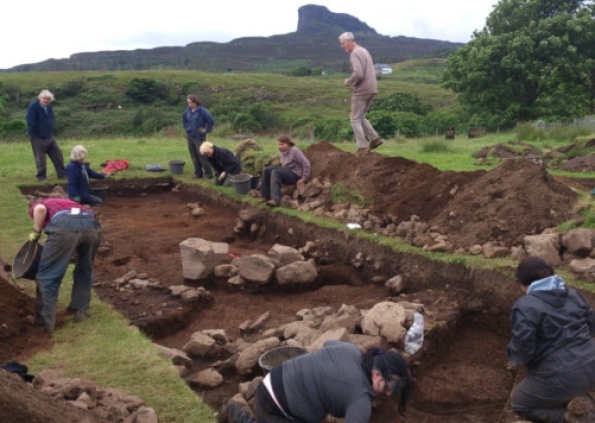 Eigg History Society won £17,500 of Heritage Lottery funding to carry out an archaeological excavation on the island in an effort to locate St Donnan’s monastery. The dig at Kildonnan Graveyard on the south-east side of the island has now uncovered evidence which experts believe shows it is the exact site. Pictish pottery from the same period was also found in the graveyard. Emeritus Professor John Hunter, a forensic archaeologist based at the University of Birmingham, has been leading the excavation thanks to his fascination with the story of St Donnan. He said: “I think it is fair to say that the findings surpassed all our expectations. “We now know that this part of the island was a special place for worship and burial throughout time, dating back some 4,000 years. “Donnan died in 617AD and monasteries of that time had circular or sub-circular walls which separate the world of God on the inside from the world outside. “We found remains of a sub-circular enclosure and remains of seventh century activity, which would fit in with Donnan’s time. As well as local volunteers, including schoolchildren, the month-long excavation was undertaken with the help of students from Glasgow, Birmingham and Cranfield universities. Donnan is said to have gone to Iona first to ask St Columba, a leading figure in evangelising the Picts to Christianity, to be his “annam cara” – his “soul friend”. But St Columba declined, claiming to see “the red cloak of martyrdom around him” and telling Donnan he was destined for sainthood. He evangelised Eigg after travelling throughout what was then north-west Pictland and finally established a “muinntir” – a small monastic community on the fertile sloping land near Poll nam Partan on the south-east side of Eigg. But, as foretold by Columba, Donnan and 50 monks were killed in 617 by Norsemen, their deaths being recorded in the Irish Annals. The current Catholic church on Eigg – called St Donnan’s – is just a few miles away.